When you install programs they place several new registry changes and files all over your system. However when you try uninstalling, they leave behind several items you will never need. This unnecessary junk accumulates over time and only helps slow down your computer. Many programs also install unnecessary background processes that run automatically. This slows your computer when it starts up and uses more resources. Install Monitor is a complete solution for solving the issue of PC performance and reliability. 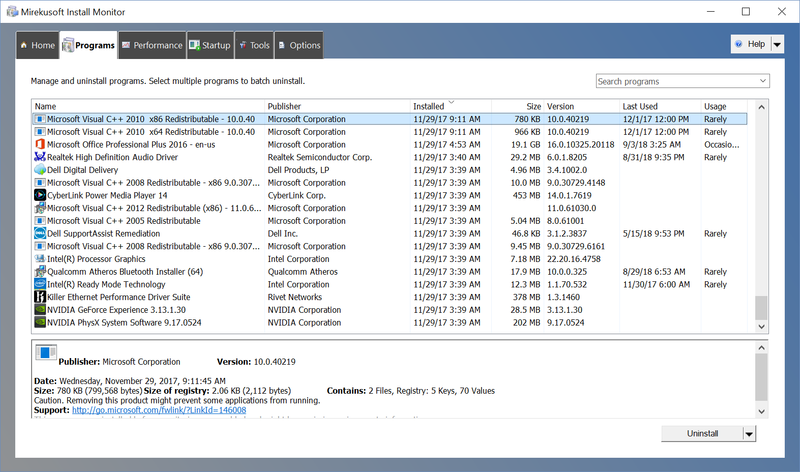 Unlike uninstallers, system optimizers, and registry cleaners that target symptoms, Install Monitor targets the problem directly with intelligent monitoring. This creates a protective layer that allows you to manage or completely remove changes made by programs. In addition to completely removing programs, it also allows you to prevent programs from automatically starting to reduce the amount of programs running and improve performance. Install Monitor is a better replacement for the Windows uninstall program. It provides detailed information about the software you installed. You can find out how much disk, CPU, and memory your programs are using, and how often you use different programs. The program tree can show you which programs were installed together. It's the #1 way smart PC users keep their system fast and clean. Get official DELL Optiplex 380 Drivers for your Windows. DELL Optiplex 380 Drivers Utility scans your computer for missing, corrupt, and outdated drivers and automatically downloads and updates them to the latest, most compatible version. Get official HP PHOTOSMART 2710 Drivers for Windows. HP PHOTOSMART 2710 Driver Utility scans your PC for missing, corrupt and outdated drivers and automatically downloads and updates them to the latest, most compatible version. Driver update for any hardware device! Update your Windows 10, 8, 7, Vista or Windows XP computer easily and automatically. Find drivers even for devices that Windows doesn't recognize and backup or restore all your installed drivers. Get official HP PHOTOSMART 7150 Drivers for Windows. HP PHOTOSMART 7150 Driver Utility scans your PC for missing, corrupt and outdated drivers and automatically downloads and updates them to the latest, most compatible version. Get official Graphic Drivers for your Windows XP system. Graphic Drivers For Windows XP Utility scans your computer for missing, corrupt, and outdated graphic drivers and automatically updates them to the latest, most compatible version. Acer Drivers Update Utility updates your system drivers for Acer devices automatically with just several clicks. It will scan your system first then download and install Acer official drivers to let your Acer device work properly. Free but professional in registry repairing, Advanced SystemCare Free 6 is a comprehensive PC care utility that takes an one-click approach to help protect, repair and optimize your computer. PC Cleaner is designed to optimize and clean your system. PC Cleaner allows very fast search and removal of unwanted and unused files, freeing space on your hard disk which enables Windows to run faster. Auto ShutDown is a program that is designed to automatically shut down your computer. You can leave your computer without worrying about turning it off manually. Smart Sys Care is the best tool to boost the speed and performance of your PC. Kwiksolve helps in enhancing the speed and performance of the PC.